A large 18th century landscaped parkland surrounds the historic house of Nannau. The roots of the estate date to at least the 12th century. Owain Glyndwr famously killed his cousin, Hywel Sele, in the park at Nannau. The estate is home to the popular Precipice Walk. The history of the Nannau estate is a mix of fascinating characters and more than a bit of popular myth. There has been a house at Nannau since the 12th century, when the estate was in the hands of Cadwfgan, Prince of Powys. The most famous episode in the long history of Nannau happened in 1402, at the height of Owain Glyndwr's revolt against the English crown. The owner of Nannau at that time was Hywel Sele, a cousin of Glyndwr and an English supporter. The story goes that Hywel invited his cousin to Nannau for a friendly bit of hunting and political debate. But Hywel had more in mind that a cousinly chat; he planned to murder the rebellious Glyndwr. The two cousins went out hunting on the estate. They spotted a stag, and Hywel drew his bow to fire an arrow But instead of firing at the stag, he turned and fired the arrow directly at Owain. That would have been the end of the legendary Welsh leader, but Glyndwr clearly did not trust his cousin, for he wore a vest of chain mail beneath his clothing. Glyndwr drew his sword, killed his cousin, and hid the body in a hollow oak tree. To be fair to Hywel Sele, another version of the story says that he intended to fire at the stag, but as he swivelled to track the running animal he found to his horror that he was aiming at his cousin. Either way, Owain Glyndwr slew his host, and having hid the body, fled into hiding. As for Hywel Sele, his body was not found for another 40 years. The tree gained a reputation as a place of evil, where strange noises were heard. When the ancient tree was struck by lightning in the early 19th century it was cut up and used to make commemorative wooden objects for a coming of age party in honour of Robert Vaughan in 1824. Vaughan was a direct descendent of Hywel Sele. One of the drinking vessels made from the oak is now held in the National Museum of Wales in Cardiff. On the west wall of the walled garden is a pillar marking the spot where the Derwen Ceubren yr Ellyll, or Howel Sele's Oak, was reputed to stand. The name Derwen Ceubren yr Ellyll translates as the Hollow Tree of the Demons. The medieval house was burned down in 1404 during Glyndwr's rebellion. In the early 17th century Huw Nannau Hen built a new house, but that seems to have disappeared by the 1660s, perhaps a casualty of the Civil War. In 1693 Col. Huw Nannau rebuilt the house, but when the Nannau male line died out the estate passed to the powerful Vaughan family by marriage. In 1795 Robert Hywel Vaughan built a new house in Georgian style. At the same time he began to lay out the landscaped parkland for which Nannau is famous. The house stands 3 storeys high and 5 bays wide, on a square plan, built with local slate and stone with sandstone dressings. The interiors feature plasterwork ceilings and marble fireplaces. The Nannau estate was once among the largest designed landscapes in Wales, with a late 18th century landscape park and a medieval walled deer park. Within the park are tracts of ancient woodland, with carefully designed rides, a pair of walled kitchen gardens, a walled ornamental garden, and wide lawns dotted with water features. The setting is superb, with the landscaped gardens giving way to outstandingly scenic views. Much of the parkland was laid out by Sir Richard Williams Vaughan at the beginning of the 19th century, a time known as 'the golden age of Nannau'. Williams Vaughan spent huge amounts of money to create a picturesque parkland, with eye-catching follies, lodges, arches, and gates. He planted an enormous number of trees, and had a vast network of winding paths built. Some of the work was undoubtedly undertaken to alleviate local unemployment in the wake of the Napoleonic Wars. Part of the landscaped parkland designed by Sir Richard Williams Vaughan is the Precipice Walk. This popular route through the estate has been open to the public since 1890. 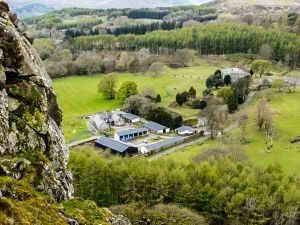 The walk begins at Coed y Groes and describes a circular route past Llyn Cymwch, along the slopes of Moel Cymwch and Foel Cymwch, with superb views over the Mawddach and Nannau House in the valley below. This is is not officially a public footpath, and is closed one day per year. The walk starts from the Saith Groesffordd car park, Llanfachreth, at Grid reference SH 746 212 (postcode LL40 2NG). The walk is 3 miles long and should take no more than 2 hours.